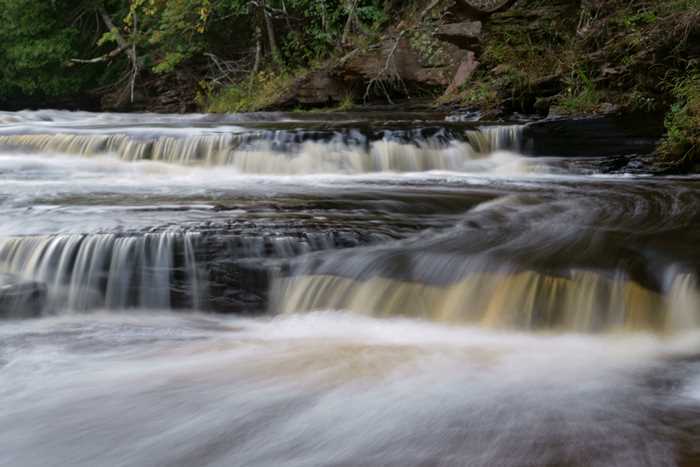 Several nice waterfalls make the western side of Porcupine Mountains Wilderness State Park worth visiting. 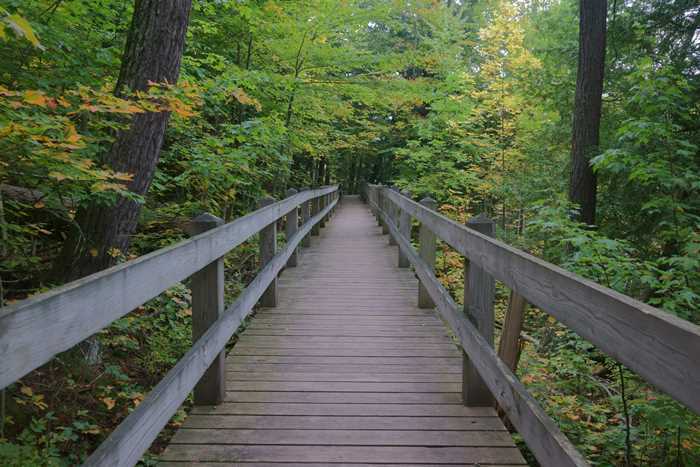 This area is known as the Presque Isle Scenic Area, and trails allow you to loop around the north end of the Presque Isle River, just before it empties into Lake Superior. The river tumbles over Nawadaha, Manido, and Manabezho Falls on its way to the lake. 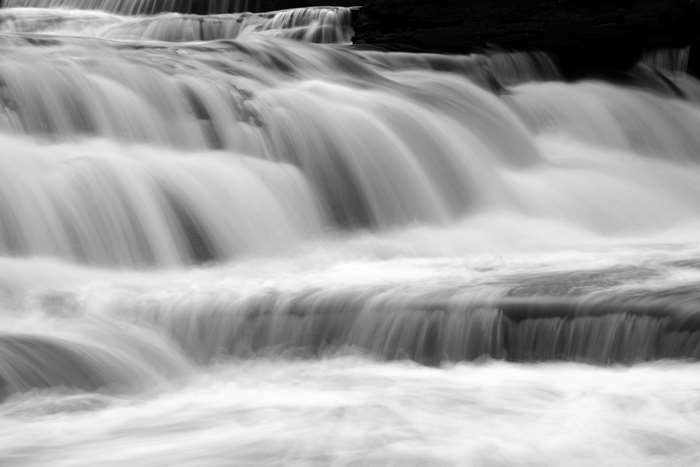 Each one of the Presque Isle Scenic Area waterfalls is different and beautiful. The Presque Isle Scenic Area is located directly north of Wakefield, Michigan, on County Road 519. 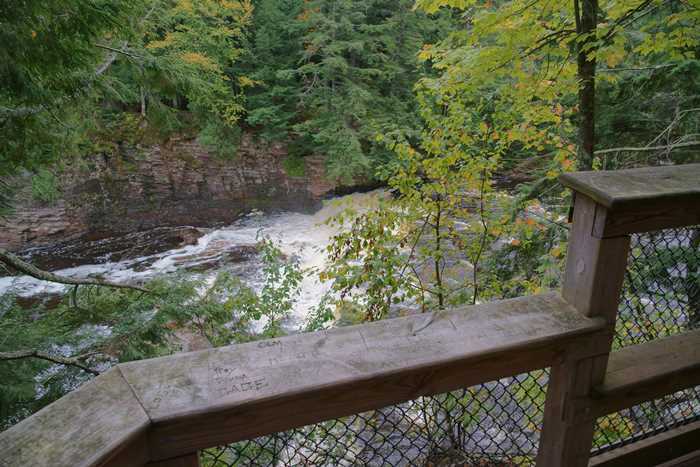 If you’re coming from Lake of the Clouds or other parts of Porcupine Mountains Park, follow the park road west through the park. Just before the road turns south towards Wakefield, you’ll cross the Presque Isle River and see a turnout for the scenic area. 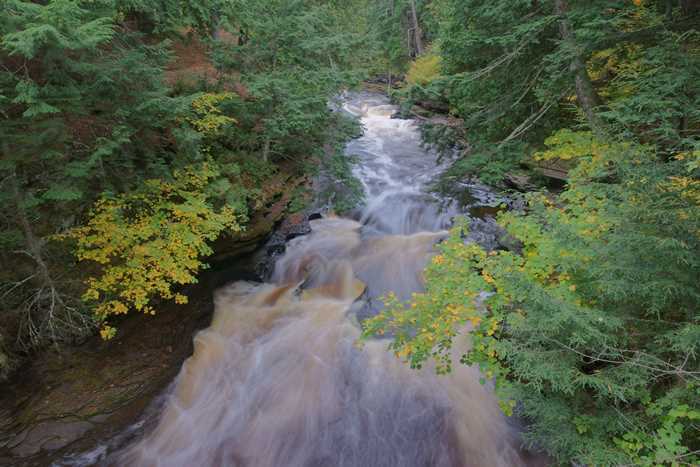 Okay, I must admit, by the time I got to this area of the Porcupine Mountains Wilderness State Park, I really should have called it a day and headed on to my motel for the night. But, it was the next-to-last day of my vacation, and I knew the final day was going to be a rainy washout. So, I pressed on, even as the daylight faded, the clouds rolled in, and the sprinkles began. After all, that’s the perfect weather (minus the raindrops) for photographing waterfalls. And my final stop in the park offered three of them. I parked near Nawadaha Falls and headed out for a look. The first view of the falls wasn’t very impressive, and I knew I’d regret it if I didn’t find a way down to the river. … which was easily fixed by making the photos black-and-white. I’m pretty sure this was a smaller cascade in between Nawadaha Falls and Manido Falls, the second of the Presque Isle Scenic Area waterfalls, as you head north along the banks of the river. So was that enough? It was really starting to get dark, but I knew the trail continued, and I really wanted to see all three waterfalls. So, I kept walking (and getting further from my car as I went. … high above the banks of the river. Once I got to that third waterfall, I decided I didn’t have enough time to find my way down to the river and take more pictures. 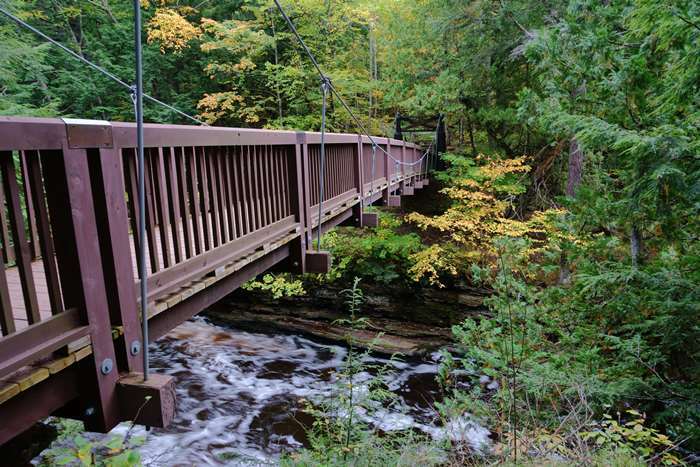 At the north end of the trail, just before the river meets Lake Superior, there’s a footbridge that crosses over the river. I decided the view of Manabezho Falls from the bridge was good enough. For this visit, it would have to be good enough. The trail continues as a loop on the other side of the footbridge, and if I had the time, I could have taken it all the way back to where the park road crosses the river, then hiked back to the car. But, I didn’t have the time. And, I had already hiked a surprisingly long distance from my car to this point. Sure, I had stopped for a lot of pictures of the Presque Isle Scenic Area waterfalls, but at this point, it had been an hour since I left the car. I decided it would be quicker to take the road back to my parking spot, rather than follow the indirect trail that went up and down, in and out, as it followed the east side of the river. I’m not sure that was a good idea, because as it turns out, the road is also very indirect. Once I made it to the Manabezho Falls parking area and started hiking along the road, I realized I was headed further west, rather than south. Yes, it did eventually curve. At one point I resolved to hitch a ride from the next car that drove by, but nobody ever did. Like I said, it was getting pretty late. So, Day Seven ended with a very late drive to my motel in Ironwood (that included a second wrong-way detour thanks to my GPS — although it wasn’t nearly as bad as the one earlier in the day). And as expected, Day Eight was a rainy mess. But I still managed to see a few interesting places along the way, so read on! 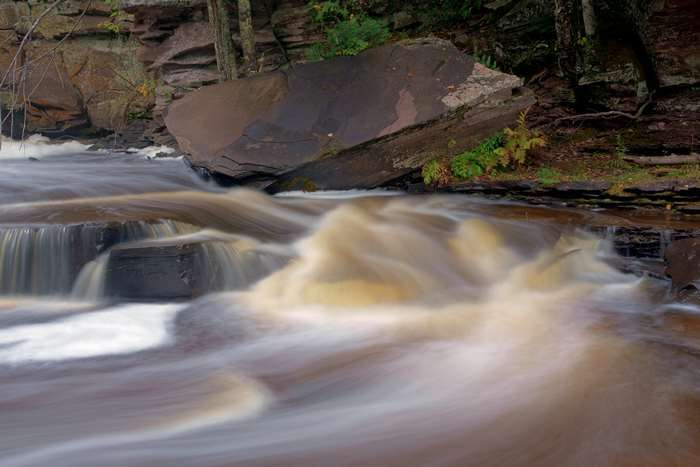 I wouldn’t say that it’s mandatory that you drive out to the west end of Porcupine Mountains Park to see the waterfalls. Most of the park’s other attractions are on the east side or in the middle. But, if you do make it all the way through the park before dark, the loop trail around the three waterfalls at Presque Isle Scenic Area would make a great end to the day.